Basketball is the only major sport of strictly American origin. 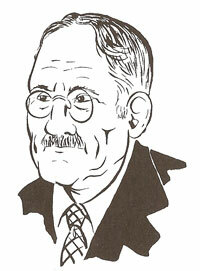 Its inventor was James Naismith, a Canadian-American of Scottish ancestry. Played world-wide, the game is a major school sport in the U.S. It has also been added to the Olympic Games as a major team sport. ■ Naismith was born November 6, 1861, at Almonte, Ontario, the son of a Glasgow-born immigrant. His mother, surnamed Young, was also of Scottish descent. As a youth, Naismith was an outstanding athlete at McGill University in Montreal. ■ Planning to enter the ministry, he enrolled at Montreal�s Presbyterian Theological College. He changed his mind, however, when he received the offer of a position at Springfield College in Springfield, Massachusetts. His duties included the teaching of physical education. The outgrowth of the job was basketball. ■ Naismith moved on to the YMCA College in Denver, Colorado, where he taught physical education from 1895 to 1898. From 1898 until 1937 he headed the physical education department at the University of Kansas. Along the way he earned an M.D. degree at the University of Denver. He died November 28, 1937, at Lawrence, Kansas. ■ It was at Springfield that Naismith began experiencing with indoor games while searching for an activity between the football and baseball seasons. He nailed two bushel baskets to the walls at opposite sides of the gymnasium. The players aim was to put a soccer ball in the baskets. Naismith wrote 13 basic rules that embody five principles that still govern the game a century after it was invented in 1891. ■ It is now one of the greatest indoor spectator sports in the United States as well as in many other countries. The Naismith Trophy is one of the most prized awards in basketball.